But you and your guests or children will not miss it. Starlight is a real holiday place. Form here you can watch the day unfold, the tide come and go the colours change and the birds feed. At high water you can swim at the bottom of the garden and at low tide you can collect cockles or pipi’s on the Estuary. In the evening you can saute your catch on the BBQ and wash them down with a local Sauvignon. You can sit in any room with your book and watch nature going about its day or join together with family or friends at the main table or on the balcony to play cards or a board game or have a feast prepared in the kitchen or at the BBQ. When you are ready for an adventure you can start small and walk the 1kM to the start of the Cable Bay Walkway and go as far as you like on this fantastic cliff top coastal walkway through farmland and native bush with a marine reserve below. Or have Cable Bay Kayaks pick you up at the door for and estuary paddle or a kayak around Pepin Island (some of the best coastal paddling in New Zealand). You will likely see seals, sea caves and learn about the local Maori history. Down the road 3kM toward Nelson is Cable Bay Adventures where you can ride a horse along back country, drive four wheel motor bike along tracks and through streams, fly the sky wire or have a game of paint ball. Maybe you would just like a really nice coffee or a light lunch at the Cable Bay Cafe. We reserved the Starlight house without much knowledge of its specific location on Cable Bay. We were delighted by the amazing view and the ever-changing bay. We were out on the deck for many hours, viewing the bay, surrounding hills, and the intense stars at night. There are kayaks available for use and we went out for an enjoyable trip around the bay. The house is set in a heavily wooded hillside with plenty of privacy. We were only two people so we did not make full use of all the bedrooms available but the house is roomy and comfortable. The host Chris was amiable and we had a nice chat. We did not require anything from him during our stay but he was available for any need that might arise. The kitchen is large enough for meal preparation and we enjoyed several home cooked meals during our visit. We would happily return to Starlight house on a future visit to Cable Bay. Chris was our very first booking while my best friend and I visited from the USA. He was a fantastic host and incredibly hospitable. He had everything explained very well for reference in the event power should go out etc. Those listed details made our stay quite comfortable although we needed to refer just once, to his detailed booklet. I was especially grateful when comparing other stays we had in along the west coast, Chris was by far THE BEST host of them all (it’s not always just about the house). Yet, Chris’ home was most lovely, with the most beautiful view. It was clean and had good quality sheets (a huge plus to this gal) on the beds. We could’ve used a couple more towels since we were from another country, but everything was manageable and not a complaint. We played some of the games provided, and took in all we could during our stay. The only negative (and I felt there was only ONE negative).....the neighbors dogs. I’m a dog person yet cannot understand ‘why’ anyone would ever be so rude and allow their dogs to bark as much as these dogs did. Not Chris’ fault, yet they were annoying. 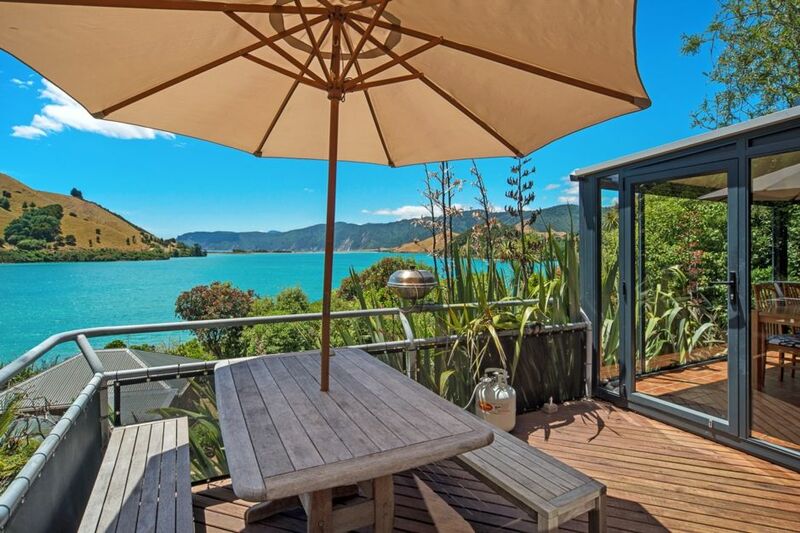 I would love to come back to NZ and spend an entire week at Chris’ home in Cable bay, only next time I’d bring my husband and kids to enjoy. The perfect spot to relax! This is clearly a cherished family bach: all the little details are so well thought through and combine to make the place deliciously livable. From the skylights perfectly positioned to frame specific constellations, to the insect screens fitted on precisely the windows you want to open to create a cooling breeze and the epic collection of games, it was sad to tear ourselves away - even as new adventures beckoned! Delightful comfortable property in a stunning location. Having direct access to the estuary and being allowed use of the boating equipment was brilliant. We also just enjoyed staring at the ever changing view! Great birdlife all around and superb walking on Cable Bay. We would highly recommend this property and hope to return soon. Chris is a great host. The home is well equipped with everything you need. Great place to watch the tide roll in through the big picture glass. Very relaxing spot. Excellent location overlooking the lagoon and out to see, with beautiful changing scenery with the fluctuation of the tides. The house is well located literally on the water, and is a short walk to the main beach down the road. The house itself is well-equipped, warm and dry, light and airy, with views to die for.